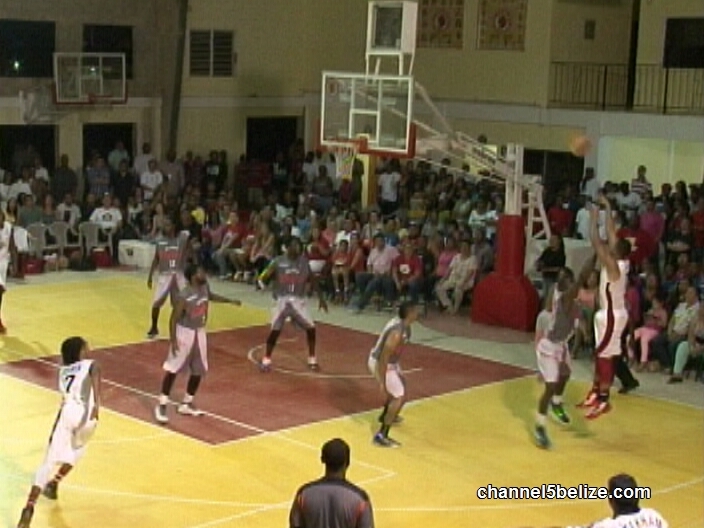 The Sacred Heart Gym in San Ignacio hosted the showdown between undefeated Cayo Western Ballaz and the surging Belmopan Red Taigaz in a ballgame that was certainly to test the mettle of the most dominant team at this time in the season. The home side roar out in the opening minutes with good team work as Akeem Walters hooks up with Kurt Burgess who lays it in for 2 and records an impressive 11 pts and a massive 14 pts in this ballgame. However, the visitors are not about to surrender anything. Eskridge Terrell lights up the scoreboard with this triple and would tie for the game high with 19 pts. At the end of the 1st quarter, it’s a close ballgame with the Ballaz holding on to a 3 pt lead. Roger Troyer would assume the scoring responsibility for his team and their go to man for points would not disappoint, striking for a team high 17 pts plus getting a double digit 10 rebounds. If you like the spin move, Akeem Walters provides a clinical display for 2 of his 9 game points. In the meantime, last year’s MVP, Farron Louriano, was intent to teach his former team a lesson. The turnaround one hander crashes through the net as Capital City mounts a charge. Hanging around the net, Louriano picks up a rebound and 2 pts with the put back of the missed shot from Travis Lennon and would finish with 2 doubles of 19 pts and a monstrous 18 pts to lead in both categories for the night—sharing the scoring lead with teammate, Terrell Eskridge. At the half, the Belmopan Red Taigaz have wrested the lead in a 36-34 score. Roger Troyer raises up to knock down this mid range jumper as the Ballaz try to create some separation. And when Geovannie Lennan attacks this time, he makes it a 50 to 44 Cayo lead at the end of the 3rd. Lennan would put up 11 pts tonight. Early in the 4th, Farron Louriano raises up in the paint to land the finger roll. Terrell Eskridge then drains this long distance dial and we’ve got a ballgame people. With 19.1 to go, Belmopan clings to a 1 pt lead. Jarred Velasquez is fouled going to the rim and is awarded 2 free throws. Alas he could have made it a 3 pt lead at least guaranteeing overtime play—he misses both. Kurt Burgess wins the fight for the rebound, sends to Troyer who goes down court and finds Geovannie Lennan who wins the game for Cayo Western Ballaz with the uncontested layup. Belmopan gets burned 61 to 60; the Ballaz go to a 7 and 0 record. Belmopan folks to 5 and 2. In other results, the defending champions, SP Tiger Sharks ran past the OW Running Rebels 73 to 66 to show 5 wins, 1 loss since the result from the game with No Limit remains undecided. 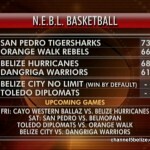 Belize Yellow Pages Hurricanes beat the Dangriga Warriors 68 to 61 and now both teams show 3 wins and 4 losses. Belize City No Limit got 3 pts from a winless Toledo Diplomats who forfeited. Looking ahead, on Friday, Cayo takes on the Hurricanes at BES Auditorium. 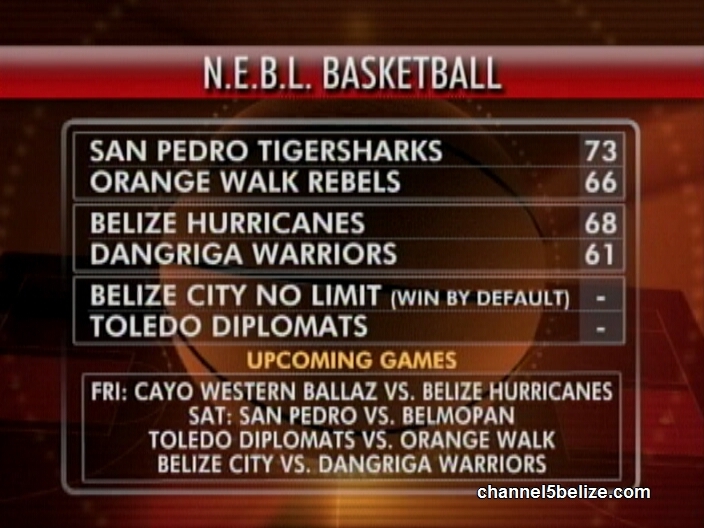 On Saturday, San Pedro travels to Belmopan Taigaz; Toledo Diplomats should travel to OW and Belize City No Limit will host Dangriga Warriors. On the cricket scene, play in the Herrian Parks National Cricket Competition, Easy Does It made easy work of Bright Star in a 230 to 63 final score. Berlan beat Cashu Medico’s 85 to 84 with 6 wickets to spare; Sunrise outshone Brilliant 86 – 83 with 5 wickets to spare and Wicked Eleven toppled Isabella bank 132 to 207. 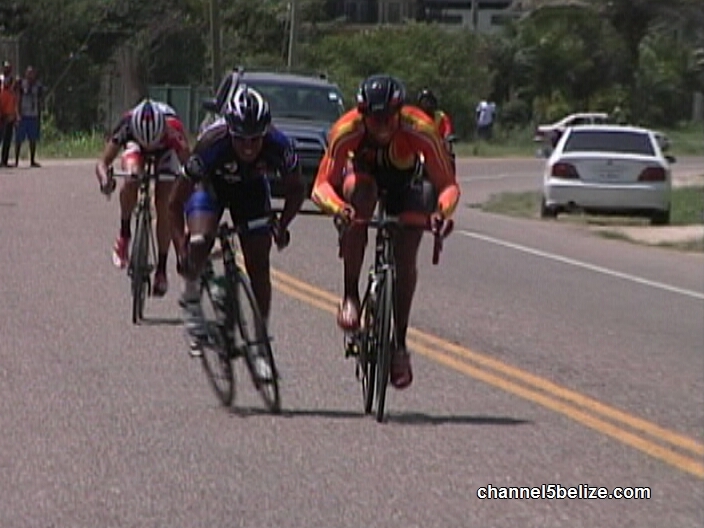 In cycling news, the last race before the 2015 Cross Country Classic took off Sunday morning from Belize City to Mount Hope and back—a distance of 120 miles and here’s the blast off with some 63 riders in the hunt. At the top of Mount Hope in search of the turning point it’s Joel Borland of Digicell 4G Elite grabbing the premie. In the meantime, Tariq Land of Western Spirit was forced out of the race due to an unfortunate accident. At mile 44 on the return we have a breakaway pack that includes Joel Borland, Byron Pope, Giovanni Choto, Henry Morreira, David Henderson, Brandon Cattouse and Oscar Quiroz. At mile 6, we find a new configuration. It’s now a 4-man lead featuring Brandon Cattouse, Byron Pope, Joel Borland and Giovanni Choto. It boils down to a heated sprint; Brandon Cattouse gets the jump, Byron Pope attacks on the outside at the tape, it’s a photo finish that gives Brandon Cattouse of C-Ray Road Addicts the Win. Byron Pope of benny’s Megabytes settles for 2nd and Joel Borland of Digicell 4G Elite has to settle for 3rd. All clocked at 4 hours 51 minutes 36 seconds setting a new record. 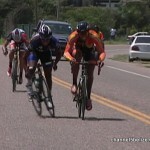 Giovanni Choto of C-Ray pulls up 4th while Henry Morreira of Smart Zoom Team prevails for 5th place. Looking ahead folks, this Sunday, March 29th brings up the 16th Annual Junior Cross Country Cycling Classic which runs from Succotz to Leslie’s Imports for 78 miles. Finally in football news, the Belize National Football Team begins its hunt for a berth in the 2018 World Cup by going up against Cayman on Wednesday night at the F.F.B. Stadium. Game II of the series will be staged at the Cayman Islands on the 29th March.